A ten-year-old Boise girl named Alexis Carey who suffers from a rare and severe form of epilepsy called Dravet Syndrome might be the reason Idaho will soon allow use of medicinal marijuana oil. 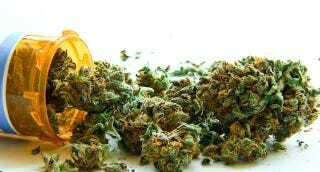 But Idaho's stringent marijuana laws do not allow for medicinal use. The family began lobbying lawmakers to decriminalize the oil almost two years ago. Now, they've got some legislative backers and an upcoming hearing, as Idaho joins a larger movement to loosen laws to allow the use of marijuana extract oil. Apparently other 12 other states have approved this magical Marijuana oil without actually going ahead and approving medical marijuana. Marijuana extract oil first received attention when a Colorado family fought and won for access for their daughter who also had Dravet Syndrome. It is similar to hemp oil, which is legal in Idaho and can be bought in grocery stores. With no known cure for Dravet Syndrome, children are often prescribed a cocktail of medications to counter the seizures. However, the heavy drugs often come with side-effects that can permanently damage a child's developing liver, kidneys and other organs. Here's to hoping Idaho doesn't prove itself to be a backwards, devilish place and will allow for this young girl to have some hope for some semblance of peace.